Is the Potential Elimination of Adult Education in Los Angeles Our Wisconsin Moment? 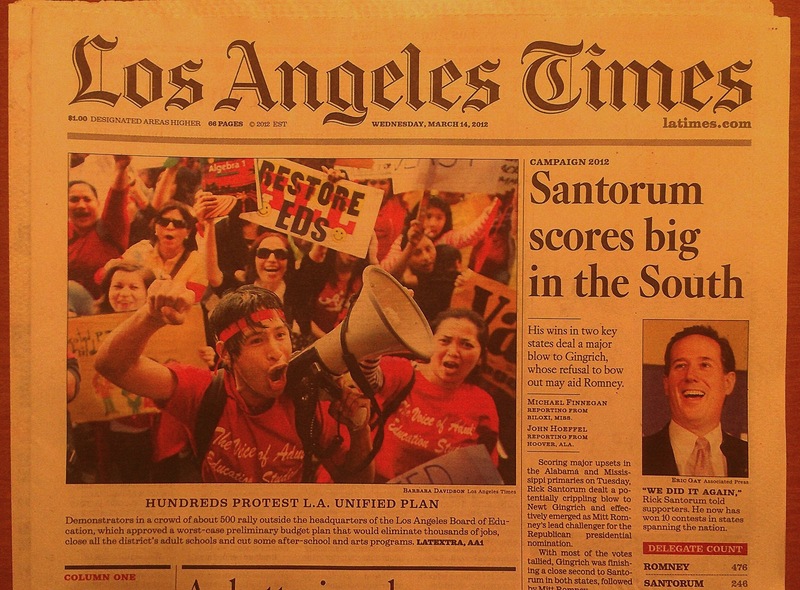 Photo of the front page of the March 14th edition of the Los Angeles Times, from the Save Adult Ed! Web site. The situation in Wisconsin galvanized the labor movement and resulted in a massive protest that engaged people from around the country. I’ve been thinking about those protests the last couple of months as I’ve been following the school budget situation in Los Angeles, where the school board has decided to completely shut down adult education unless new revenue or teacher pay cuts are accepted. Eliminating adult education in L.A. would cut off adult education services to well over 300,000 people. There are a lot of differences between the crisis in L.A. what was happening in Wisconsin a year ago in many, many fundamental ways. For one thing, the effort to dismantle public sector unions in Wisconsin was connected to an organized, long-standing national political agenda, and to my knowledge there is no political party with a specific agenda to dismantle adult education. Secondly, adult education ever had the political clout or recognition that organized labor has. But I do think an argument can be made that the attempt to shut down adult education in L.A. is a similar “watershed” moment for the field, both because of the scale of the protests (500 people at the rally yesterday), and, possibly, the ramifications. If adult education services at this scale, and with such visible, active support, can simply be dropped—if the city and the school board, in other words, gets away with doing this—does this send a message to policymakers across the country that they can get away with it too? Granted, adult education has never been in a very secure position in most states; as noted by CLASP, several states have been cutting funding for adult education dramatically the last few years, and Arizona dropped state funding altogether in 2010. But eliminating a program of this size is, I believe, unprecedented (by comparison, according to CLASP, Arizona’s 2010 cut dropped services for 40,000 people). For this reason, it feels like a dangerous line in the sand that the adult education field should not allow to be crossed, similar to the way in which labor leaders realized that the fight in Wisconsin last year had ramifications that went well beyond Wisconsin state borders.